Forces Engaged: [C] Four divisions (Gordon, Rodes, Ramseur, Breckinridge/Wharton), two cavalry divisions (Fitz Lee, Lomax), about 15,200; [U] Three infantry corps (Wright, Emory, Crook), cavalry corps (Torbert), about 39,236. Casualties: [C] 3,611 (226k/1,567w/1,818m&c); [U] 5,018 (697k/3,983w/338m). Significance: Opequon or Third Winchester (fought 19 September 1864) was the largest and most desperately contested battle of the Civil War in the Shenandoah Valley, resulting in more than 9,000 casualties. The battle was a turning point of the war in the Valley, marking the rise of Sheridan and the decline of Confederate power. 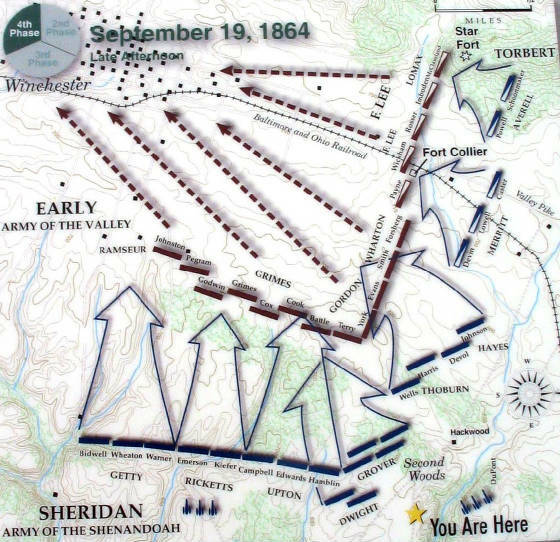 Sheridan defeated the Confederate army again three days later at Fisher's Hill (22 September), forcing it to retreat up the Valley to near Waynesboro. The CS army of Lt. Gen. Jubal A. Early suffered about 23 percent casualties. Casualties for the larger Union army under Maj. Gen. Philip Sheridan exceeded 5,000, nearly 20 percent. The Union XIX Corps sustained 40 percent casualties (2,074 men) and lost every regimental commander during its assaults on the Middle Field and Second Woods. The most severe fighting and casualties occurred in the large parcel east of I-81, north of rte. 7, west of rte. 656, and south of rte. 661. The Middle Field ranks with some of the most sanguinary fields of the Civil War, witnessing more than 3,000 casualties. CS general Robert E. Rodes and US general D. A. Russell were both killed within a few hundred yards of the Dinkle Barn site at the entrance to Winchester Mall. 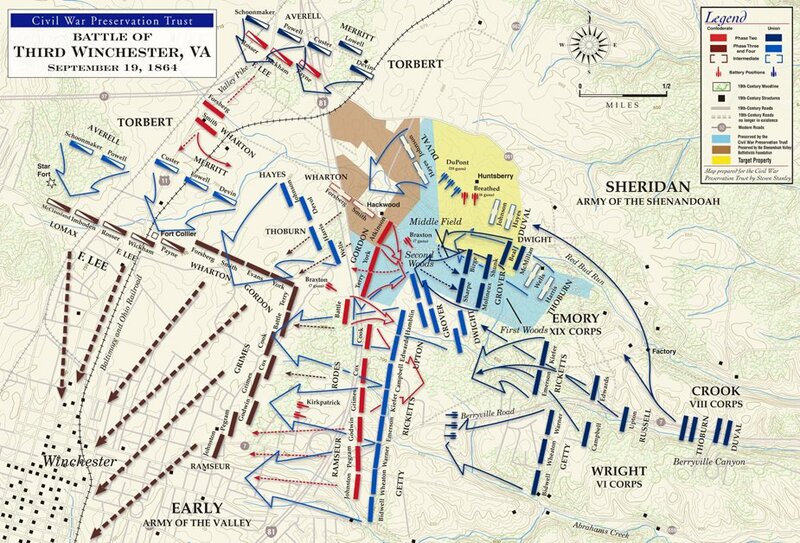 Description of the Battle: The 3rd Battle of Winchester, part of Sheridan's Valley Campaign, was Grant's response to Early's relentless pressure throughout the Shenandoah Valley. US Advance (19 September): Maj. Gen. Philip Sheridan's army advanced from the vicinity of Berryville on the Winchester-Berryville Pike about 0200 hours, 19 September 1864. At earliest light, Brig. Gen. James Wilson's cavalry division crossed the Opequon at Spout Spring and advanced through a defile known as Berryville Canyon, followed by the US infantry (VI Corps, XIX Corps, and Crook's corps). At the canyon's mouth the cavalry met the first elements of Maj. Gen. Stephen Ramseur's CS division and drove them back on their supports. Johnston's brigade deployed across the pike and held back the Union advance, while the rest of the division came into line to cover the Berryville Pike and Senseny Road farther to the south. The US cavalry launched several mounted and dismounted charges, driving the CS infantry back about 150 yards to the vicinity of the Dinkle Barn. Here Ramseur stiffened his defense with artillery, and the US cavalry withdrew as its infantry began to deploy. Wilson's division moved to cover the US left flank where it remained for the rest of the battle. Deployment of US Infantry: In the meantime, the Union infantry bogged down in the narrow confines of Berryville Canyon, dashing Sheridan's hopes of quickly taking Winchester and defeating the CS army in detail. Maj. Gen. Horatio Wright's VI Corps of three divisions (Getty, Ricketts, Russell) emerged from the canyon in order. Getty's division deployed south of the pike with its left flank resting on Abrams Creek. Ricketts' division formed north of the pike on Getty's right and extending to Redbud Run. Russell's division was held in reserve. 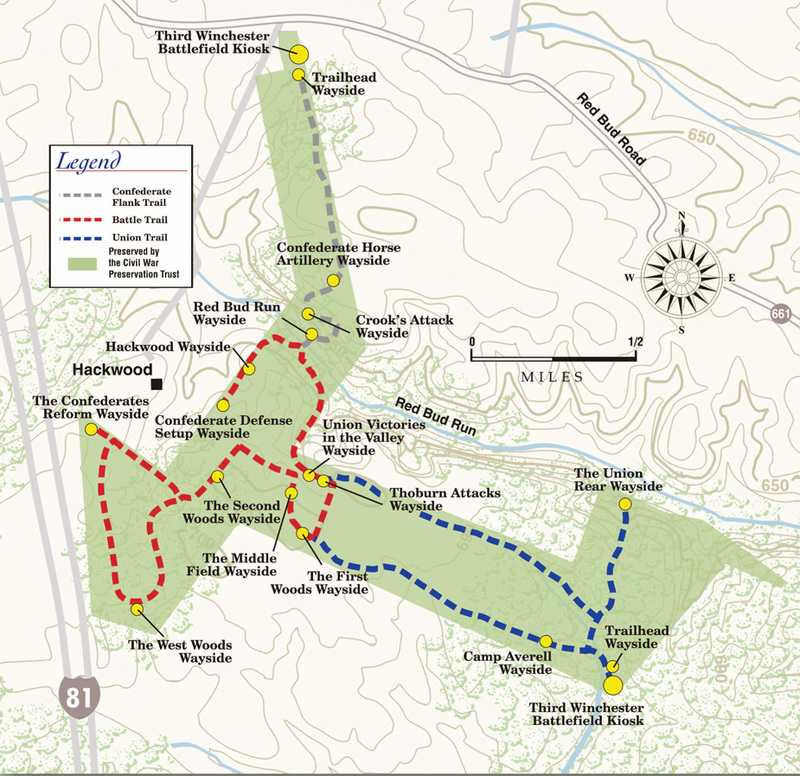 The XIX Corps of two divisions (Dwight and Grover) did not begin crossing until after 0900 hours and eventually deployed north of the pike into the First Woods, connecting with Ricketts' right. Sheridan established his headquarters near the Berryville Pike, probably south of the road on the Eversole Farm. As the US infantry deployed, the CS batteries opened a furious fire from behind the Dinkle Barn. Union batteries swung into action on both sides of the pike to engage the CS guns. In the meantime, Lt. Gen. Jubal Early concentrated his scattered divisions. Rodes' division, marching from near Stephenson's Depot, deployed to the left and rear of Ramseur's division in the West Woods. Gordon's division extended the line across the Hackwood Farm to Redbud Run. Wharton's infantry and Fitz Lee's cavalry division drew a line across the Valley Pike north of town near Stephenson's Depot. CS batteries deployed on high ground along Baker Lane north and south of the West Woods, and north of Redbud Run. Skirmishing continued along Ramseur's front. Fighting in Middle Field: At 1140 hours, a US signal gun boomed and Grover's division of four brigades (Birge, Molineux, Sharpe, and Shunk) launched its attack from the First Woods across Middle Field toward the Second Woods behind which Gordon's division waited. CS horse artillery north of Redbud Run played havoc with the flanks of Grover's attacking line. Birge's brigade reached the woods, driving back skirmishers, but then came up against Gordon's main line and were staggered. Sharpe's brigade came up on Birge's left, and the fighting became desperate. The Confederate line broke, falling back across the Hackwood property. Seven CS cannon in the Hackwood Lane fired canister pointblank into the US attackers, throwing them back. Gordon now launched a counterattack with two brigades, driving Birge and Sharpe out of the Second Woods and back across Middle Field. Grover ordered Molineux to advance and plug the gap that had opened between Birge and Sharpe. The firing was so intense that Molineux's flanks seemed to ``melt away.'' Shunk's brigade was thrown forward to bolster the wavering Union line, coming in on Molineux's right rear. Shunk closed to within sixty yards of the CS line in the Second Woods. The two lines delivered pointblank volleys into each others' ranks. Gordon again counterattacked, and the Union attack collapsed. The wreckage of Grover's division went streaming back across the Middle Field to the safety of the First Woods. The CS horse battery (Breathed) north of Redbud Run again worked execution among the retreating division. Every regimental commander in Grover's division was killed or wounded; casualties totaled nearly 1,500. Beal's brigade of Dwight's division deployed in the treeline at the east end of the Middle Field and advanced into ``that basin of Hell'' to stem the retreat. Gordon's men waiting along the treeline of the Second Woods laid down a murderous fire. The Union brigade did not reach within 200 yards of the Second Woods before being pinned down. They expended all of their ammunition before retreating back to the First Woods. The 114th New York suffered casualties of 60 percent (188 of 350 effectives). McMillan's brigade, personally directed by Corps commander Maj. Gen. William Emory, advanced. They reached a shallow ravine about 200 yards from the Second Woods, where two regiments (8VT and 12CT) clung on for nearly two hours. By 1300 hours, the main thrust of the XIX Corps attack was blunted and its ranks decimated. By 1400 hours, firing on this end of the field sputtered out from sheer exhaustion. Fighting Near Dinkle Barn: At 1140 in conjunction with the XIX Corps' advance on the right, Getty's and Ricketts's divisions of the VI Corps launched their attack against Ramseur's line, which was positioned on high ground, stretching from the Dinkle Barn south behind Abrams Creek. Ricketts' division on the right was ordered to guide its attack on the Berryville Pike, which takes a sharp jog to the left in front of the Dinkle Barn. As they advanced, a gap widened between the VI Corps and the XIX Corps on the far right. Keifer's and Emerson's brigades ruptured the Confederate center at the Dinkle Barn and moved to capture a battery of artillery in front of the West Woods. Ramseur's left flank now gave way and Confederates began to drift back toward Winchester. Rodes's Counterattack: Just as Ramseur's left flank gave way from the Union attacks, Maj. Gen. Robert E. Rodes brought his division forward from its protected position in the West Woods. About 1330 he launched a devastating counterattack into the gap that had opened between the VI and XIX Corps. Battle's Alabama brigade ``came out of the woods like a whirlwind,'' crushing Ricketts's division, which formed the right flank of the VI Corps. About this time, General Rodes was killed by shrapnel. He fell somewhere along the woods line. Union soldiers streamed back along the Berryville Pike, while two US batteries astride the pike tried to slow the CS assault. From his command post on Eversole's Hill, Sheridan and Wright witnessed the disaster. Sheridan immediately committed his reserves to stave off certain defeat; this was David A. Russell's division of three brigades (Campbell, Upton, and Edwards). Campbell advanced his brigade astride the Berryville Pike with Edwards' brigade to his right. General Russell, directing these maneuvers, was mortally wounded. The two brigades struck Battle's attackers head-on and stalled them in the ravine from which they had emerged and drove them back on their supports at the edge of the West Woods--the rest of Rodes' division. Upton's brigade came in on Edwards' right advancing from the edge of the Second Woods. The two divisions--Rodes' and Russell's--closed, exchanging murderous volleys. Upton's impetuous charge stopped the CS counterattack and drove it back into the West Woods. Russell's division was then withdrawn out of range to regroup. Wright called Upton's attack the turning point of the battle. Cavalry Action: Concurrent with the above events, there was cavalry fighting along the Valley Pike north of Winchester. About 0500 hrs. the Union cavalry division of William Averell crossed the Opequon near Darkesville and moved to the Valley Pike, steadily pushing back the 23rd Virginia Cavalry, which fought a delaying action back to Bunker Hill. There the 23VA were reinforced by the 62nd Virginia mounted infantry. About 10 o'clock, Union cavalry attacked at Bunker Hill, forcing the CS cavalry to retire. Averell continued pushing south on the pike to link up with Merritt's division about 1400 hours, near Stephenson's Depot. South of the old Charles Town road, the Confederate cavalry units were stiffened by Smith's infantry brigade (Wharton's Division). About 1330, Devin's brigade arrived on the road to the depot. About one mile south of the depot, it encountered McCausland's brigade drawn up in line of battle and attacked, driving the Confederates back in confusion. The 23VA cavalry and the 62VA mounted infantry attacked the Union flank disrupting the charge. McCausland and Smith retired one mile to the lightly entrenched line at near Collier Redoubt where they were reinforced by Fitz Lee's two brigades (Wickham and Payne) and Wharton's infantry division. Maj. Gen. Fitzhugh Lee fell wounded, during the fighting south of Stephenson's Depot. The Union cavalry deployed five brigades in line of battle, stretching from the railroad west toward the ridge near the intersection of the Valley Pike and Welltown Road. Crook's Flank Attack: About 1300 hours, Sheridan directed Crook's corps of two divisions (Thoburn and Duval) to advance from its reserve position near Spout Spring. The divisions marched to near the ``Factory'' on Redbud Run, where they split up. Thoburn's division moved west on the south bank of Redbud into the First Woods to relieve the XIX Corps. Duval's division crossed the run and turned west accompanied by the artillery of Capt. Henry DuPont. Duval's division deployed near the Huntsberry House. DuPont unlimbered 18 guns on what has been named DuPont Hill, opposite Gordon's flank in the Second Woods and opened fire. Crook now ordered Duval's division forward into a ``wall of flame.'' They swept across Redbud Run at the Hackwood House, turning Gordon's flank and advancing against Wharton's line, stretching from Collier Redoubt east. About this time, Thoburn's division charged out of the First Woods into the Middle Field. This two-pronged assault forced Gordon to abandon the Second Woods and align himself with Breckinridge to his left rear. The CS line was now drawn into a compact L-shape, anchored by cavalry at Star Fort. Wharton's division faced north. 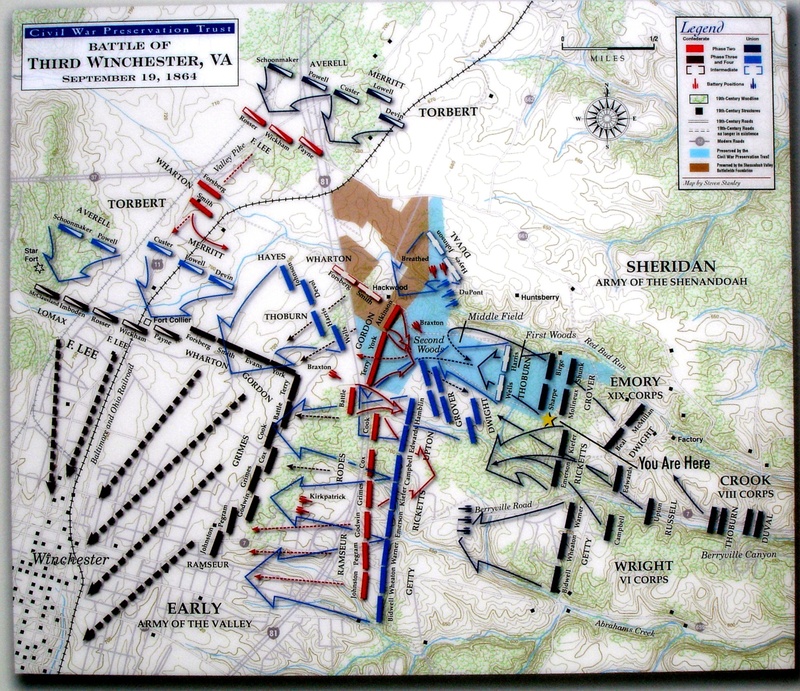 Gordon's division made the turn of the L and Rodes' and Ramseur's divisions extended the line south to Abrams Creek. Collapse of CS Line: With the success of Crook's attack on the right, Sheridan ordered a general advance against the constricted CS position on the plateau just north and east of the town. The Confederates were posted behind stone fences, rail barricades, and in shallow earthworks constructed in 1862. They could retreat no farther without losing organization in the streets of Winchester. As the Union advance closed from east and north, firing became fierce and desperate. The massed artillery of both sides fired case shot and canister. General Sheridan rode forward to the battle lines to urge his troops forward. About 1530 hours, as the infantry fighting reached a crescendo, Averell and Merritt advanced their cavalry divisions astride the Valley Pike, first at a walk and then at a thundering gallop. They swept over the CS line at Collier Redoubt driving back the CS cavalry on the low ground below Star Fort. Schoonmaker's brigade of Averell's division repeatedly attacked Munford's cavalry at Star Fort, eventually overrunning the work. The CS infantry withdrew to another line about 150 yards to the rear but the damage was done. The sound of Union cavalry pounding in their rear spread panic all along the Confederate line, and soldiers began streaming to the rear and ``whirling through Winchester.'' Wharton's and Gordon's divisions seemed to disintegrate. Seven Federal horseman captured Confederate battle flags, each earning a Medal of Honor. Rodes's division (commanded now by Grimes) performed the difficult maneuver of ``changing front'' to the north to stop the onrushing US cavalry. Early's army retreated in disorder. Aftermath: General Early fashioned a defensive line at Kernstown (probably at Pritchard's Hill and behind Hoge's Run) which saved his wagons and most of his artillery. Cavalry and elements of the VI Corps probed this makeshift CS defense as night fell, but the US forces were too disorganized by success to mount an effective pursuit. After dark, the CS army withdrew up the Valley Pike to Fisher's Hill south of Strasburg. Gen. Sheridan established his headquarters in Winchester at the home of Lloyd Logan. Casualties were so severe that nearly every sizeable structure in Winchester served as a hospital after the battle. 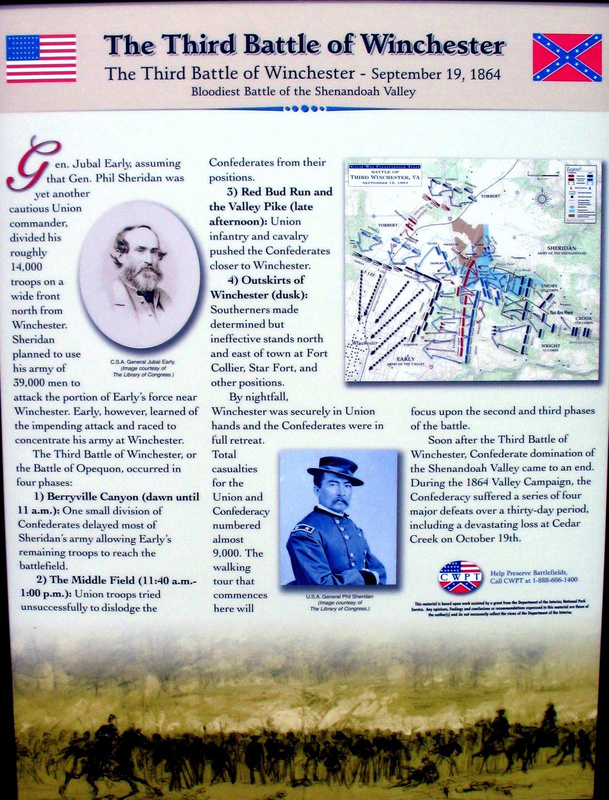 Advance to 3rd Battle of Winchester: A Civil War History. What began about daylight did not end until dusk, when the victorious Union army routed the Confederates. It was the first time Stonewall Jackson's former corps had ever been driven from a battlefield, and their defeat set the stage for the final climax of the 1864 Valley Campaign. The Northern victory was a long time coming. After a spring and summer of Union defeat in the Valley, Lt. Gen. Ulysses S. Grant cobbled together a formidable force under Phil Sheridan, an equally redoubtable commander. Sheridan's task was a tall one: sweep Jubal Early's Confederate army out of the bountiful Shenandoah, and reduce the verdant region of its supplies. The aggressive Early had led the veterans of Jackson's Army of the Valley District to one victory after another at Lynchburg, Monocacy, Snickers Gap, and Kernstown. Five weeks of complex maneuvering and sporadic combat followed before the opposing armies ended up at Winchester, an important town in the northern end of the Valley that had changed hands dozens of times over the previous three years. Tactical brilliance and ineptitude were on display throughout the day-long affair as Sheridan threw infantry and cavalry against the thinning Confederate ranks and Early and his generals shifted to meet each assault. A final blow against Early's left flank finally collapsed the Southern army, killed one of the Confederacy's finest combat generals, and planted the seeds of the victory at Cedar Creek the following month. Scott Patchan's vivid prose, which is based upon more than two decades of meticulous research and an unparalleled understanding of the battlefield, is complimented with numerous original maps and explanatory footnotes that enhance our understanding of this watershed battle. Rich in analysis and character development, The Last Battle of Winchester is certain to become a classic Civil War battle study. About the Author: A life-long student of military history, Scott C. Patchan is a graduate of James Madison University in the Shenandoah Valley. He is the author of many articles and books, including The Forgotten Fury: The Battle of Piedmont (1996), Shenandoah Summer: The 1864 Valley Campaign (2007), and Second Manassas: Longstreet's Attack and the Struggle for Chinn Ridge (2011). Patchan serves as a Director on the board of the Kernstown Battlefield Association in Winchester, Virginia, and is a member of the Shenandoah Valley Battlefield Foundation's Resource Protection Committee. Sources: National Park Service: American Civil War; Official Records of the Union and Confederate Armies; Civil War Preservation Trust.